One Minute Medicine is a book about making lifestyle changes that improve health outcomes. It draws on author Dr. Werner Spangehl’s two decades of clinical experience in family practice. This is the story of David Mackenzie, a 42-year-old lawyer who suffers a heart attack while rushing to his Vancouver law firm. After discharge from hospital, he returns home by taxi where he finds a booklet entitled 12 Habits of Healthy People. David learns valuable lessons about nutrition, exercise, smoking cessation, relaxation and restorative sleep, and—somewhat to his surprise—about the importance of purpose, meaning and balance. One Minute Medicine discusses the major determinants of health and outlines small, but meaningful, changes which can result in abundant energy and stamina to optimize our potential. The book also explores happiness—and as health and happiness are interrelated, many of the determinants are similar. The broader determinants of health and happiness, such as job satisfaction, marital harmony and living in a place that is consistent with our purpose and mission are tremendously important, and often go unrecognized. Neglecting these aspects of health is more lethal than a poor diet and smoking! For David, following the 12 Habits becomes a catalyst to reaching Magna Vita—a full and vibrant life that balances body, mind and soul. 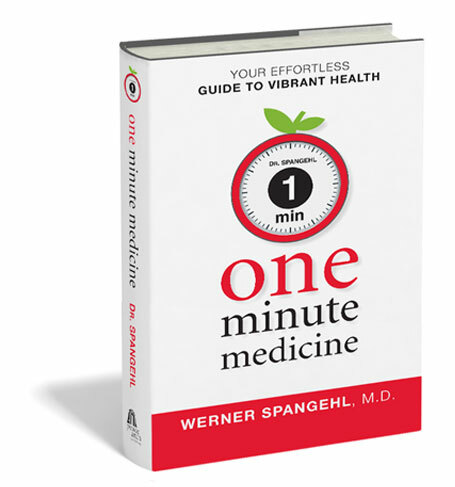 Dr. Spangehl demonstrates how to achieve vibrant health, one minute at a time. What makes this book unique is that it concisely demonstrates how incremental and easily implemented changes to one’s lifestyle can result in a dramatic improvement in energy, happiness, health outcomes and longevity. Oftentimes, in family practice, patients present with symptoms (their “illness”) such as fatigue, weight gain, depression, anxiety, nausea, headaches, rashes and so on. They fear these symptoms are due to a serious disease such as cancer, thyroid disease or other metabolic problems, or underlying infections. While serious medical conditions always need to be ruled out, these symptoms frequently have their genesis in more nebulous conditions such as social disconnectedness, marital discord, isolation, spiritual bankruptcy and dissatisfaction with one’s life or situation. Neglecting these less obvious determinants of health can be disastrous. Through characters inspired by many of his patients, Dr. Spangehl outlines several of the pitfalls contributing to ill health, suggests alternatives that can lead to better health and offers you the means to make positive changes in your own life. One Minute Medicine is laid out so that every reader can extract the information they need. Dr. Spangehl discusses12 specific habits and offers suggestions on how to incorporate these into one’s life. For example, if a reader needs practical guidelines on which foods to eat and which to avoid, these are easily found. If someone is interested in omega-3 fatty acids and why they are good, and why trans fats are bad, that section can be read independently. If a reader is trying to quit smoking, Dr. Spangehl provides specific tips which have been validated in clinical practice. Similarly, there is proven information for improving sleep. Conversely, as a reader goes through the book reading the story of David and how he incorporates changes into his life, readers can skip over sections that are not relevant to them. Throughout the book, there are “one minute messages” which give a succinct summary of the information in that section, as well as inspirational quotes to ponder. Readers will reach the striking conclusion that a large variety of seemingly unrelated health conditions can be prevented or improved by very similar lifestyle interventions, which provides an elegant consistency to many of the book’s recommendations. The majority of premature deaths and age-related illnesses are preventable with lifestyle modification. Most heart attacks, strokes, many cancers, obesity, diabetes, falls, fractures, infections and many other illnesses can be prevented through proper diet, vigorous exercise and other factors that are within our control! This book will help you to live more consistently so that all of the factors that influence health and happiness align in symmetry. Vibrant health is a state of balance and harmony at all levels—mental, physical, emotional, spiritual, social and financial. It is wholeness in its most profound sense; it exists when all the elements and forces making up an individual resonate in equilibrium! Mediocrity and following the path of least resistance rarely lead to exceptional outcomes. Magna Vita—a full, healthy and vibrant life—is possible when we conscientiously live our lives with purpose and meaning. In so doing, we optimize the determinants of health that we can control in order to achieve balance, harmony and happiness.